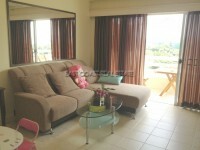 Modern, stylish large studio apartment in the exclusive Residence Condominium. Sold fully furnished, with beautiful balcony view overlooking the buildings large pool and gardens. Living area : 53 sqm.